Parties are fun but organizing them can be hard work especially when you don’t know where to start. 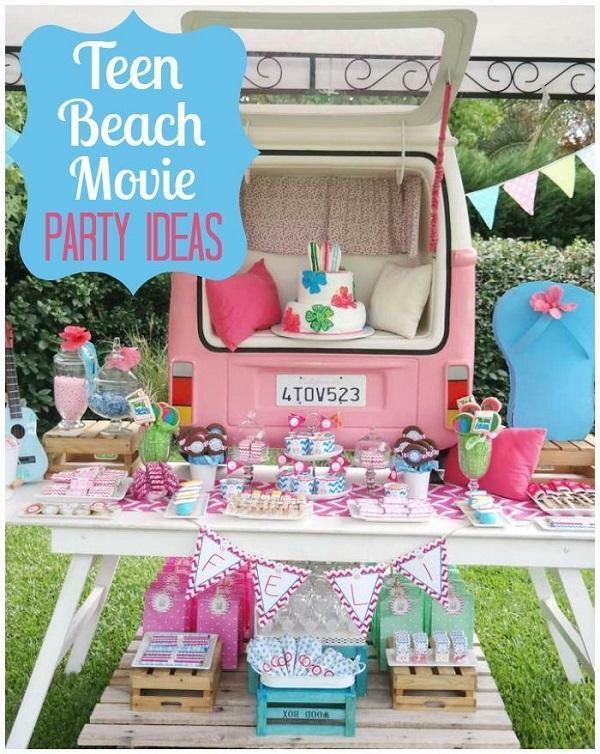 Luckily, these days there are so many party ideas which are readily available everywhere. Nowadays, there are online stores that sell party packages from invitations, decorations and even party favors. Don’t know what to do on your next birthday party? Then, try browsing online. 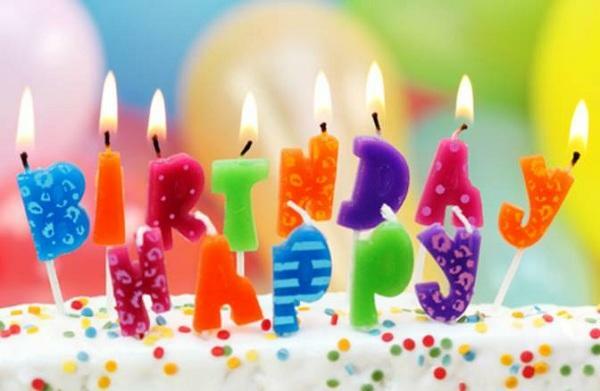 In fact, just by going to Pinterest, you can already get new ideas for your next birthday party. Girls are different from boys especially when it comes to birthday parties. You have to take note of what girls prefer in general like flowers, pink, butterflies, unicorns and the like. 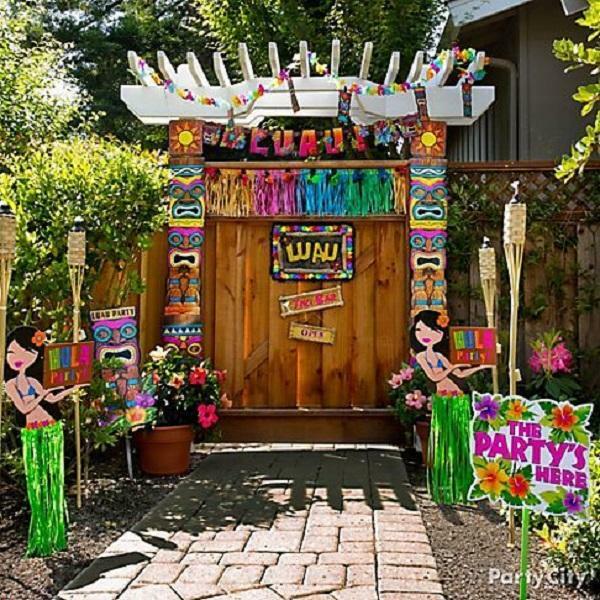 If your birthday or the celebrant’s birthday falls on Summer then, how about trying a Luau type of party instead? You can also incorporate other girly favorites along the way. Imagine Summer and everything related to it then combine them all to make something unique for your party. A girl’s birthday party does not have to be the usual pink. How about trying to incorporate warm colors along the way like yellow, orange and red? After all, Summer is all about warm, sunny days. If you would like a good contrast between warm and cool then add a little blue, green and purple to the mix. Although pool parties are a must for these kinds of Summer themed parties, outdoor venues like gardens and parks are not so bad either. However, if an outdoor venue is not available then, an indoor one will have to do. Just make sure to decorate the venue well to simulate the Summer outdoors. These kinds of parties make your guests feel free to just hang loose and enjoy themselves more. Food and drinks also play an important part during parties.. Which is why you should also plan for them well. To go with the Summer theme, colorful cakes, cupcakes and cookies will do the trick. For drinks, you can offer lemonade, fruit punch, fruit cocktails or even Pina Coladas all adorned in flowers, fresh fruits or even paper umbrellas. Always remember that creativity goes a long way when it comes to party planning. Having enough time to prepare as well as enough budget for execution helps too. Invitations are important for parties. 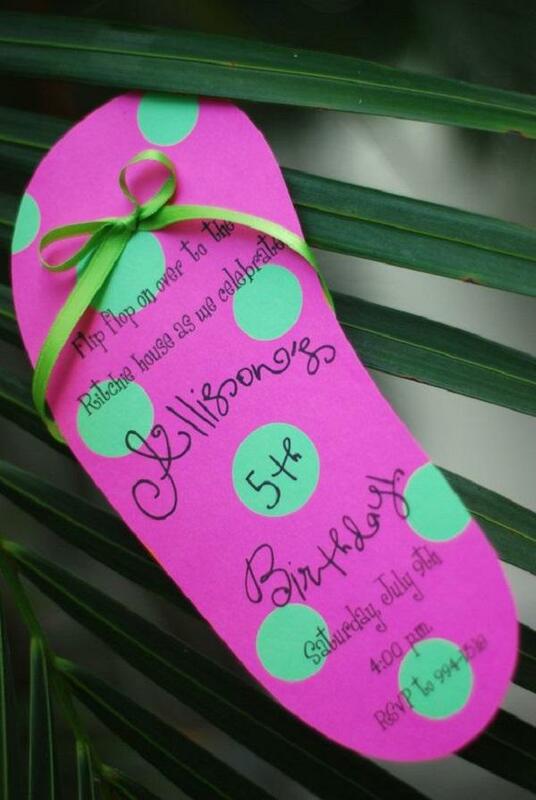 For a Summer themed birthday party for girls, why not try using a flip flop as your invitation? Whether you use a flip flop made of paper, rubber or another material is up to you. Just make sure that the print can be read well then, you do not have to worry about anything else. It also makes as a cute party favor after the event. 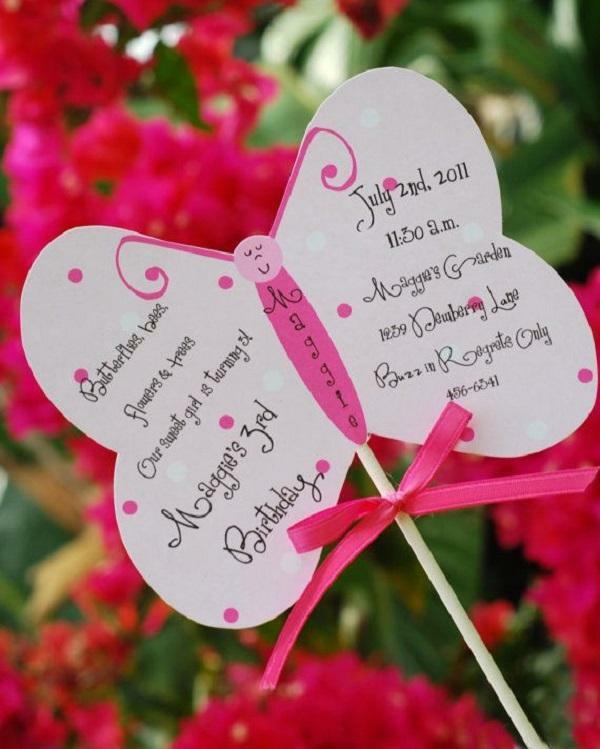 If you would like a more girly approach then how about using a butterfly pattern as an invitation? 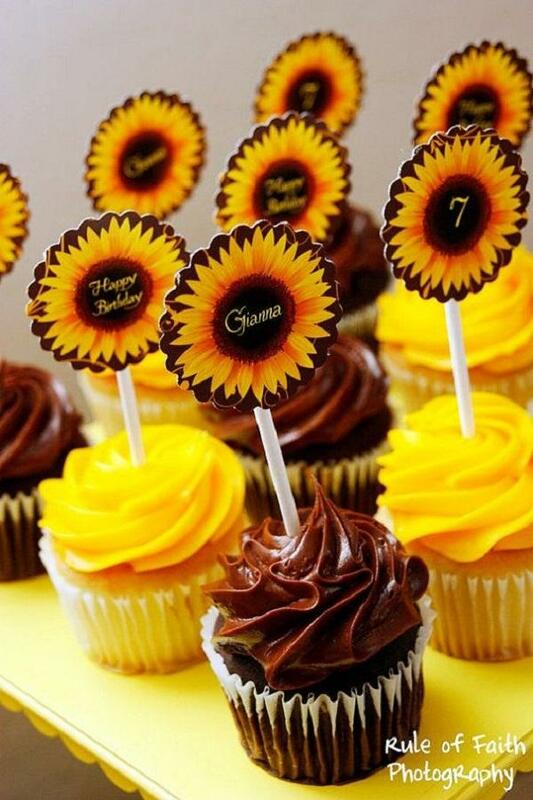 Other invitation ideas for a Summer theme party includes sunflowers, hibiscus flowers, a hula dancer and so much more. These days, invitations are more commonly sent online via email or thru social media which is why there are only a few people who focus on printed out invitations. 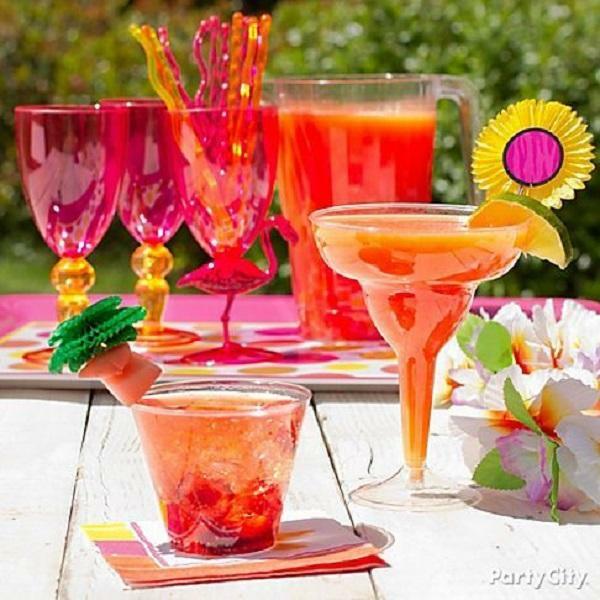 What kind of Summer themed party are you planning to do? Here’s a set up which incorporates warm colors with pink, green and blue. 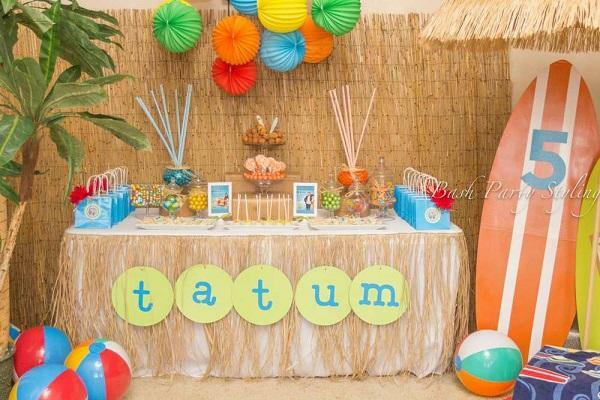 You can also see the simple leis and other simple yet colorful decorations to make this Summer set up simple yet eye-catching. 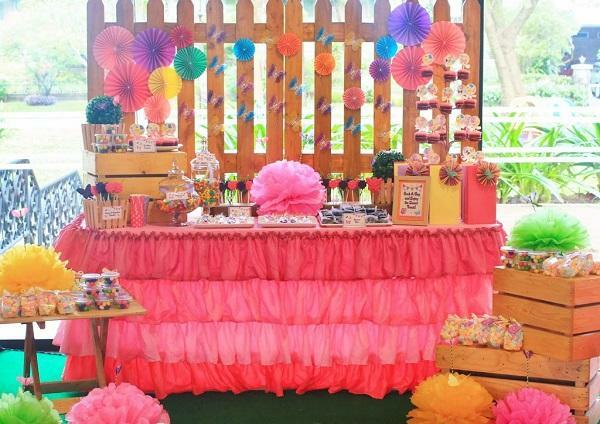 If the celebrant is not yet an adult, colorful decorations will be good for her party. Adding colorful candies will also help sweeten the deal. Colorful and kid friendly food and drinks are also a big plus. 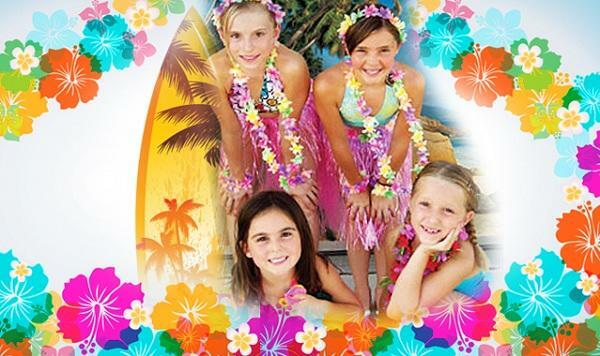 Since you are going for a Summer theme, why not ask your guests to come in tropical wear as well? This way, the birthday girl and her family won’t be the only one to be in with the theme but as well as her guests. 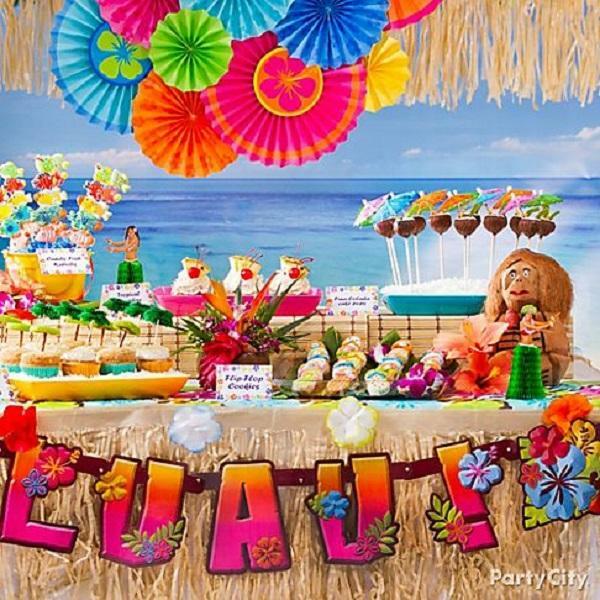 Adding drinks and food served in coconuts as well as putting lei on guests help add authenticity to the theme too. If you don’t want to go too Hawaii and want to add a little elegance to the mix then, simply go for warm colors and choose a few Summer themed accents like flowers, pineapples and paper umbrellas. After all, not everybody is a fan of luaus. If the celebrant is a teenager then you just might want to consider changing the theme a bit. 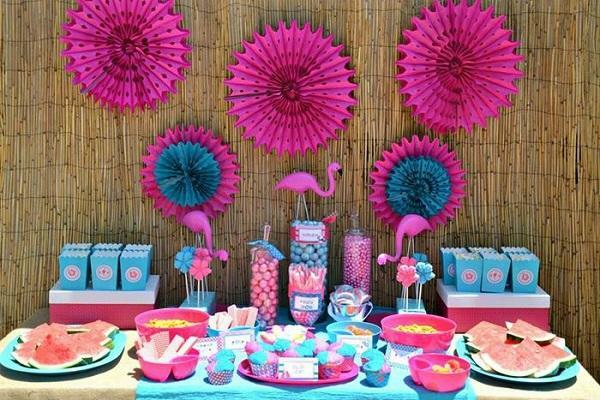 While very colorful displays are good for children’s parties, you might just want to stick to a few colors when it comes to teenage parties. Loud colors like yellow and orange should be kept to a minimum. Adding a guitar, some beach balls and some surfboards are pretty cool ideas too. 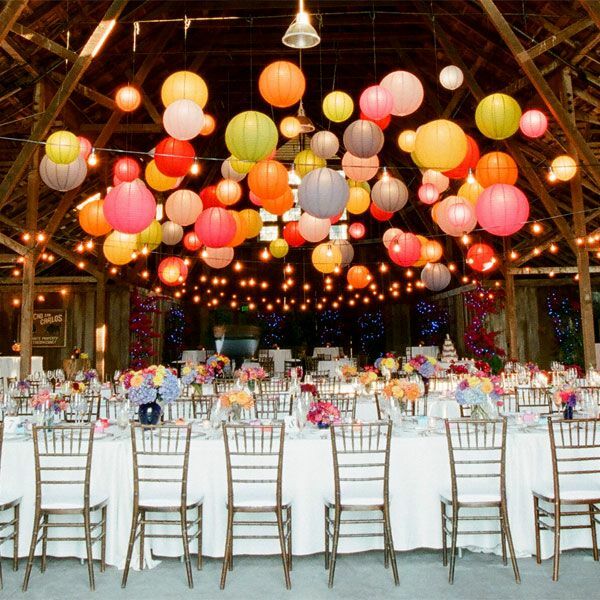 Colorful lanterns or even a background of the beach or the ocean make indoor and outdoor venues look more fun and authentic. While these kinds of set up would go well with outdoor swimming pools, you can always prepare inflatable pools if you do not have any. For a more girly Summer theme approach, pick three bright colors which compliment each other and use them to create the look that you want. By adding little accents of other colors, you will be able to balance out the set up that you want. 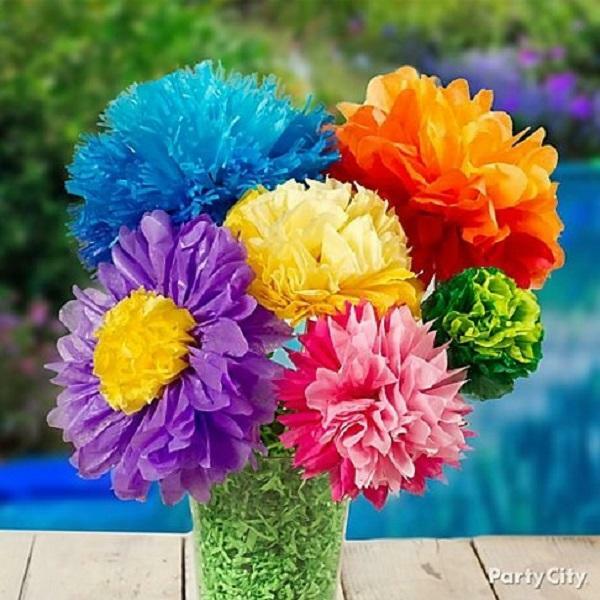 If fresh flowers with bright colored petals are not available, then go for paper flowers instead, which you can do by yourself or can even buy in stores or online. Another feminine touch to the Summer theme are butterflies. Adding butterflies of different colors to this theme makes it simple feminine yet still playful in a way. Although the colors will vary depending on what you want, sticking with just a few will do the trick. Using too many colors might just be overdoing it. Summer themed parties are known to be done outdoors however, if an outdoor venue is not available then go for an indoor venue instead. Paper lanterns go well with paper buntings or even leis. Paper flowers on vases as centerpieces complete the look. Use various colors – both warm and cool. 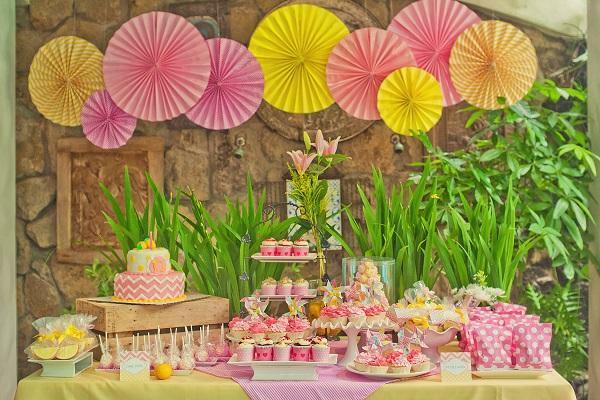 An outdoor Summer themed party will look more appealing once done on a warm, sunny day. You don’t need Summer to pull one off. All you need is good weather no matter what season it might be. 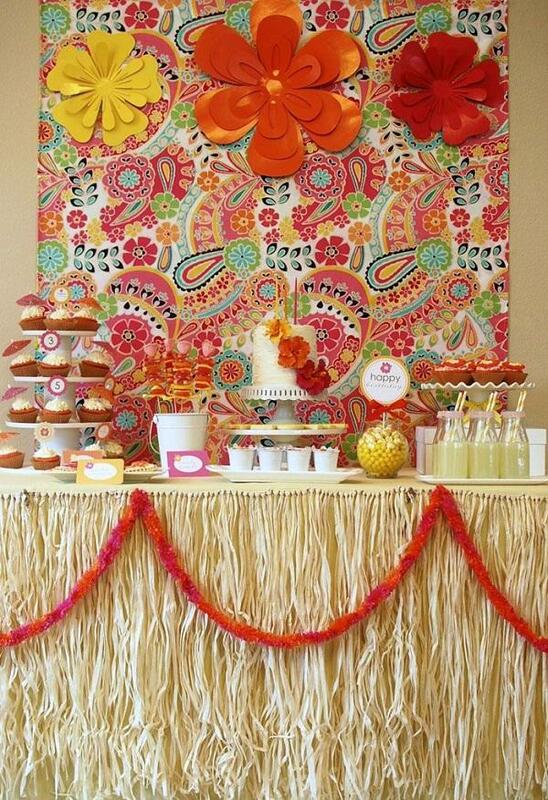 Colorful decorations become more eye-catching on warm, sunny days which makes Summer themed parties more inviting. Fun in the water is a plus for these kinds of parties. 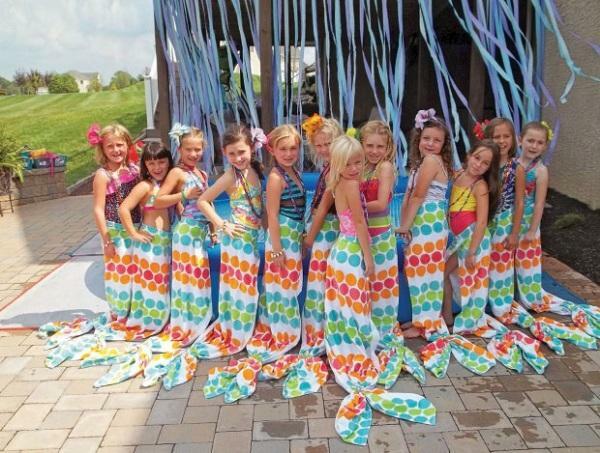 If you want to poke a little more fun to your Summer themed party then, how about adding mermaid wrap around towels to the mix? There are plenty of do it yourself tutorials on how to make them and I am sure it will be a hit for children’s parties. After all, even adult women want to dress up like mermaids too. Tired of the regular looking paper lanterns? 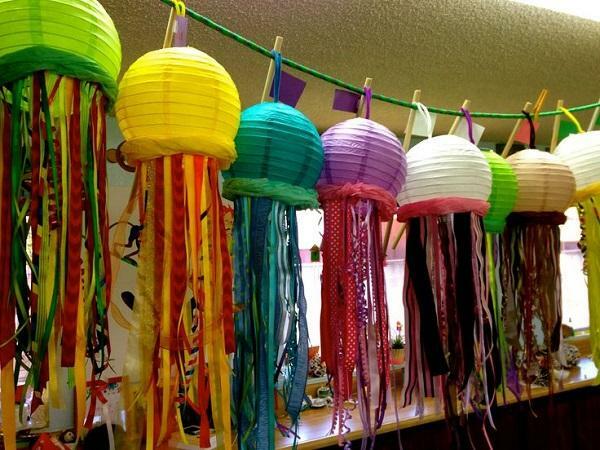 Then, try to do something different by recreating them into jellyfish paper lanterns. This is perfect for your DIY mermaid tails and pool parties. They are very simple to make and no sewing required. Why buy fresh flowers for decorations when you can just make your own paper flowers instead? 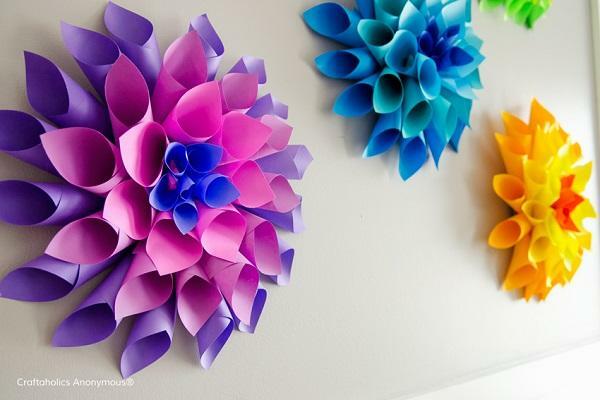 Here we have colorful paper dahlias which are very good wall decorations. There are plenty of tutorials online waiting for you. If you would like your own homemade bouquet, try making paper flowers instead. No need to buy fresh flowers, just make your own instead. Again, do it yourself tutorials are readily available online. 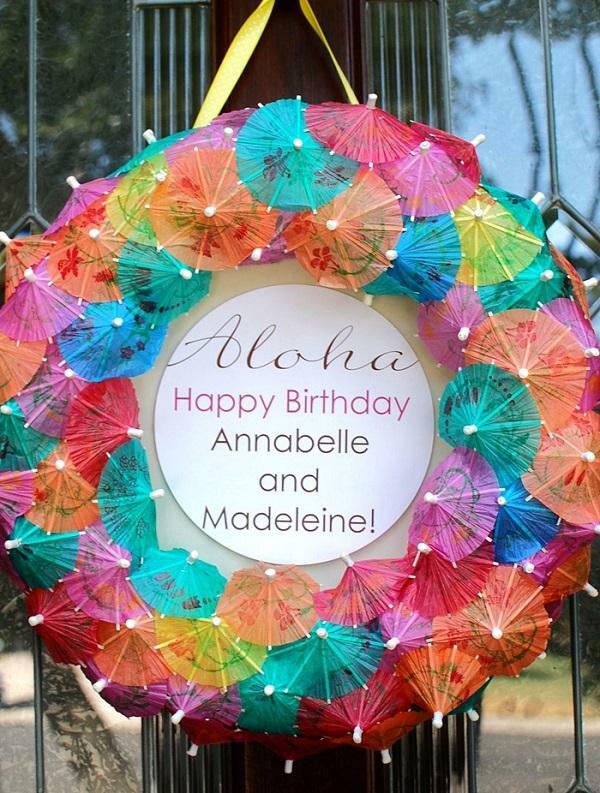 Want a different kind of wreath to match your Summer theme? Then, how about making one using paper umbrellas? You won’t think of them as decorations for food and drinks anymore once you have tried this. Again, it is very easy to make. No sewing required. Do it yourself tutorials available online. Flip flops are a must for everyone on Summer days. So, why not include them in your theme by adding them in the activities you have planned for the party? Decorate your own flip flop by using colorful water balloons is not the only option. If you would like to use other materials for decoration then use colorful ribbons, buttons and strings to do so. Be creative! This is a fun activity for both adults and children alike. Summer themed cakes should complete your Summer themed birthday. Adding colorful flowers to a plain looking cake is enough to make it into a Summer themed cake. 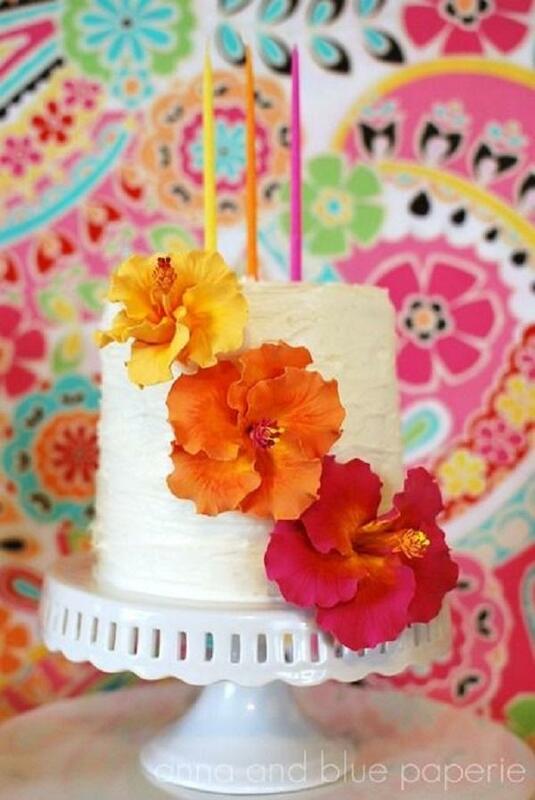 Just make sure that the color of the flowers pop out more than the color of the base which is the cake itself. 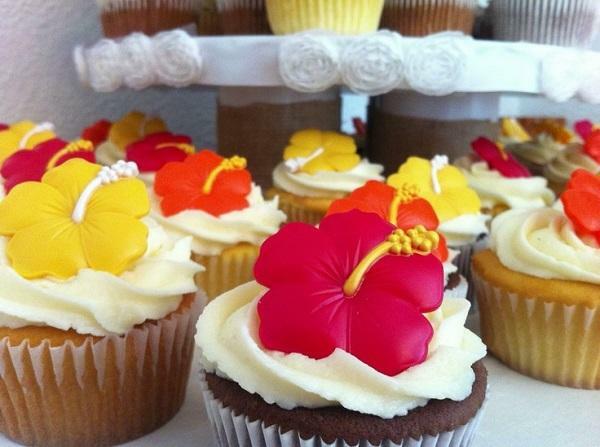 If want to go for a Luau kind of cake then make sure it screams “ALOHA”! Make sure to add elements related to Summer and the whole Hawaiian theme. Some flowers, a grass skirt, a coconut, a hula dancer and some bright colors will definitely be enough for the cake you are looking for. The beach will always complete one’s Summer. The swimming pool for some. 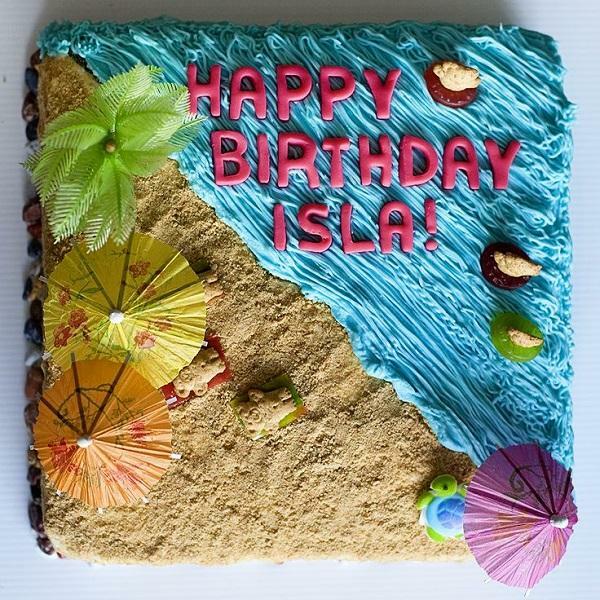 So, why not incorporate your love for the beach with your cake? This cake does not just show the beach in edible form, add a couple of colorful accents to complete the look of your Summer themed cake. Cupcakes with fresh fruits are not new in the dessert scene. So, why not bake some cupcakes and garnish them with fresh fruits? You can even bake some cupcakes with fresh fruits and garnish them with fresh fruits as well. What could go wrong with that? If you are not fond of using fresh fruits into your cupcake batter or as a garnish then why not make edible flowers instead? There are many kinds of edible flowers out there. You can use fondant, gum paste and even chocolate. Have fun making them in order to bring your regular looking cupcakes to life. 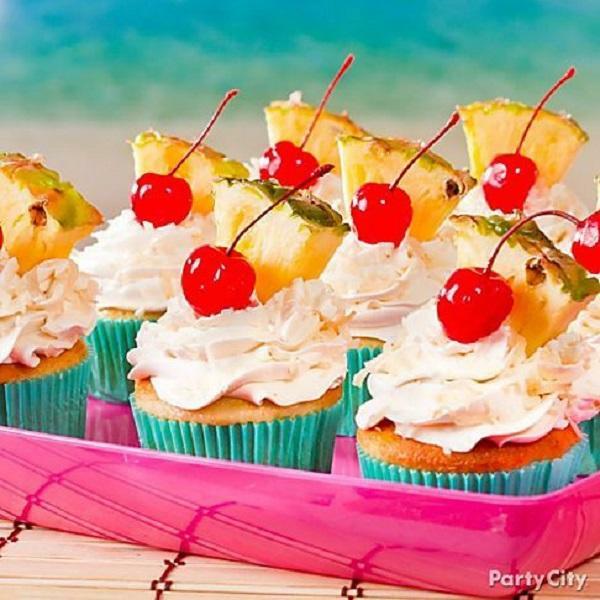 Want simple cupcakes but you also want them to follow the Summer theme? 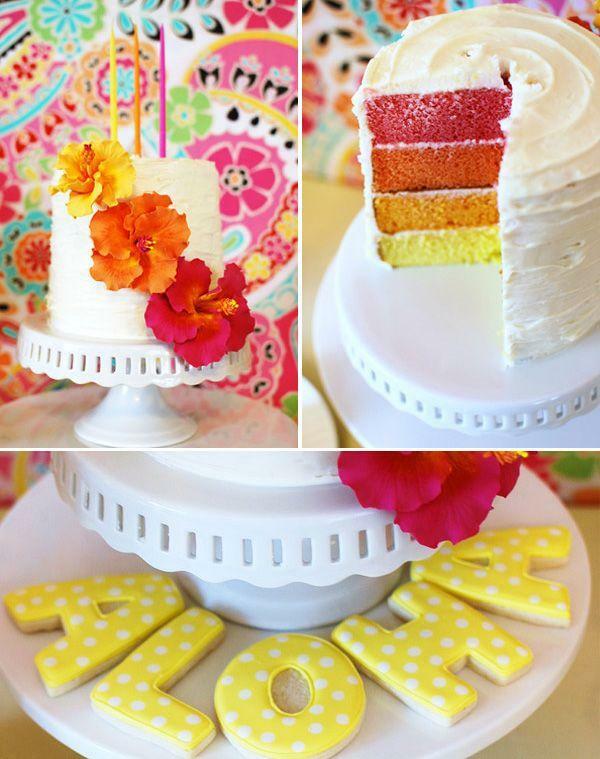 Using brightly colored icing will help your cupcakes fit in to the theme. Top them off with personalized toppers in toothpicks which you can do by yourselves and your cupcakes are go to go. 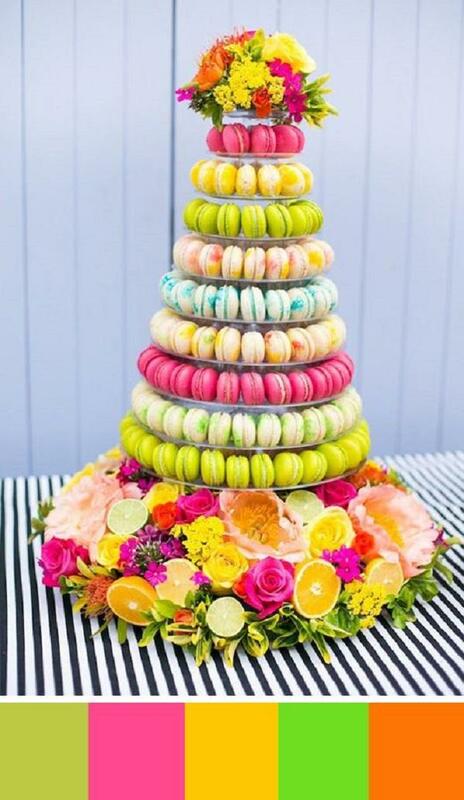 Macaroons are not always featured in birthday parties however, if you want brightly colored sweets, macaroons are just the perfect match. If you arrange them in a tower, just like in the photo, sorted by color, they would look good in any party. Finish the look off with some fresh flowers and fruits and I am sure it will be a sure hit in your dessert table. Everybody loves cookies. 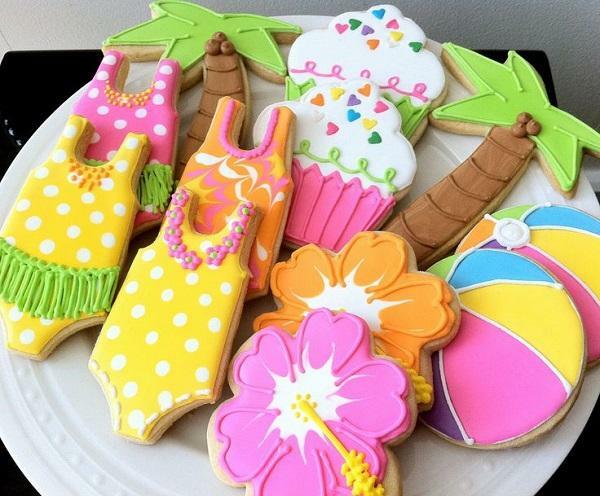 Cookies for a Summer theme party? Yes, it is possible. 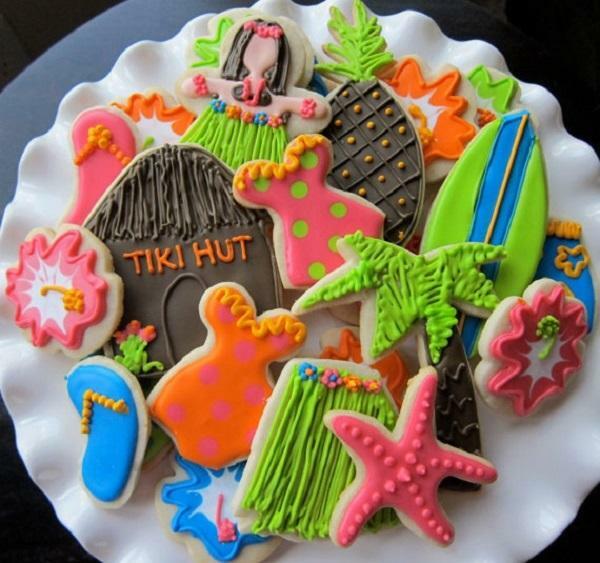 Just buy yourself a couple of cookie cutters with shapes which are related to Summer and then make sure to put some colorful icing on top. Here are some samples. Although making cookies might not be a piece of cake for some, practice makes perfect. Decorating each cookie with cake and precision helps make them look so beautiful too. If you can make really good cookies and decorate them really well then go for it. If not, look someone who can. If you don’t want the usual cupcakes for your event then how about trying out some cake pops instead? In this photo you will see a couple of cake pops which are very in to the Summer theme. 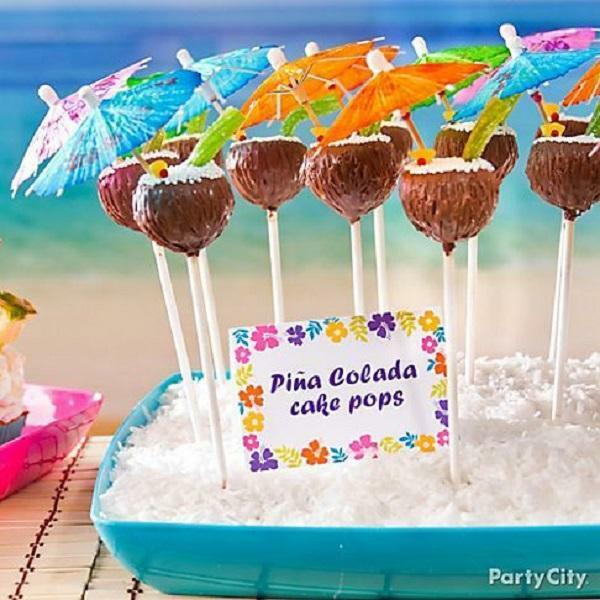 Cake pops looking like fresh coconuts with some paper umbrellas on top are pretty cool and unique too. Lastly, if food is important, so are drinks. From simple fruit juices and lemonade, why not serve some fruit cocktails and fruit punches as well? Serving them in colorful glasses and adding some fresh fruits as well as paper umbrellas would definitely complete the look. 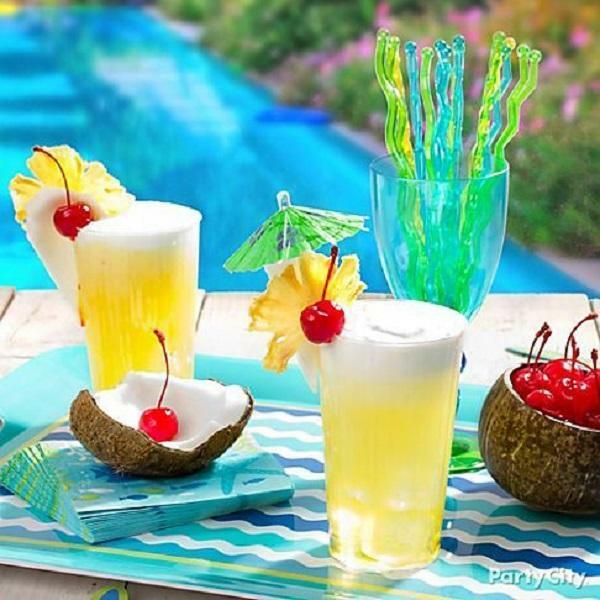 If you are a little more adventurous with your drinks then try making some Pina Coladas or Mojitos instead? Remember to follow the theme whenever serving these kinds of drinks but if you don’t feel like it, simply serving fruit juices is fine. Being creative with your food and your drinks will also help the guests enjoy your party so just have a blast in making them!